The author names artists like Wilke to demonstrate that there is a new movement in contemporary art. Art is presented in unfamiliar, different and surprising compositions. I wish Simon O’Sullivan would show more examples of work or name specific art pieces that I would be able to look up online. So the reader must take the authors word for what seems to be the upcoming of a new post post-modernist movement which is different from so far known contemporary art which involves the recasting of signifying material from elsewhere. The essay is in 3 interrelated parts that is the author’s investigation of what contemporary art is and does. Utilizing Deleuze and Guattari’s writing, he explores art’s future orientation and function. The D & G idea of the rhizome that is between, interbeing shows these practices to be an “immanent utopia”, inherently existing and connected to the possible present. The virtual is art of the possible. Unfamiliar is cultivated using film and new media that actualises “different” spatiality and temporality. Another sign, would be for example, a piece of wood, a stick, which I am burning and painting with tar and which I will attach to my painting making reference to Wotan’s sword and to Kiefer’s painting The World-Ashfrom 1982. Black straw and ashes in Kiefer’s landscape paintings stand for the ruinous and dreary state of the German landscape after the war. 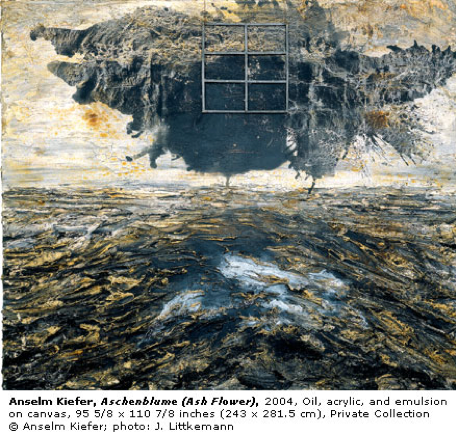 Kiefer includes a burnt piece of wood, the burnt sword of Wotan from Germanic mythology, and uses it as a metaphor for the loss and the ruin. Nothing was left, but guilt, ruin and ashes. I refer to Kiefer in my work. He spoke openly about what he thought was essential to German healing and vital for the German nation’s psychological well-being in the process of going through its ‘Vergangenheitsbewaeltigung’, its coming to terms with, and thinking about and accepting the past, instead of rejecting or forgetting it. But yes, the article is about the different and not about the art which references previous art.